It was brilliant when Jeanine sent me a message after she had collected her previous order to tell me that she could not stop looking at the cupcakes I had made for her friends 50th birthday, see post Staying with lime green for a bit. 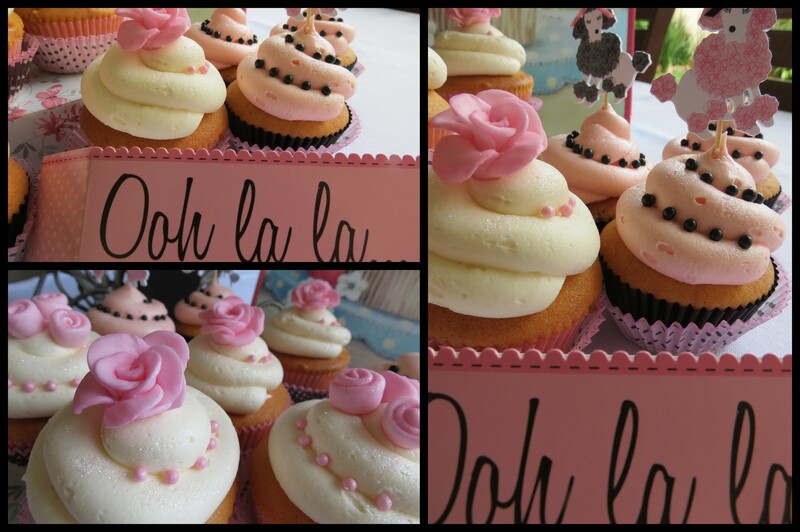 It was such a wonderful compliment and I was so pleased when she asked me to do these Ooh La La Cupcakes for her own birthday a couple of weeks later. 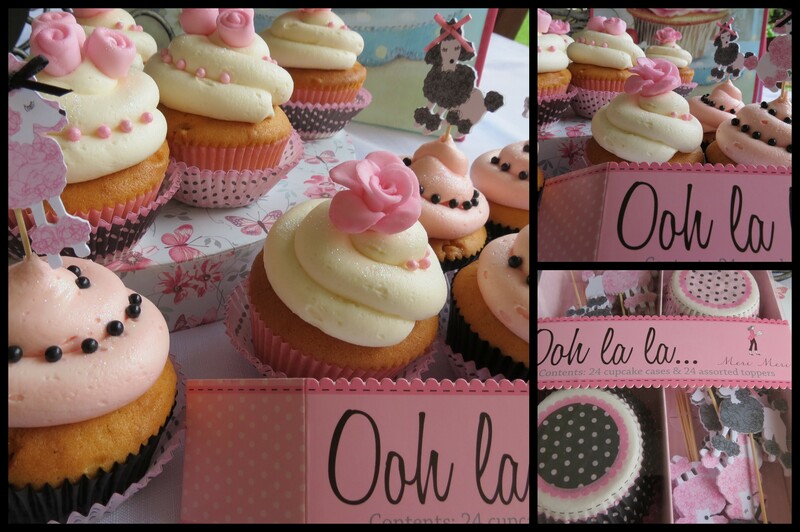 Jeanine sourced this Ooh la la pack of cupcake liners and poodle cupcake toppers and they were the inspiration for her cupcakes as she loves everything about poodles, France and the colour pink. I made pink sugarpaste roses, traditional and rolled ones and then iced the raspberry and white chocolate cupcakes in a creamy vanilla icing. 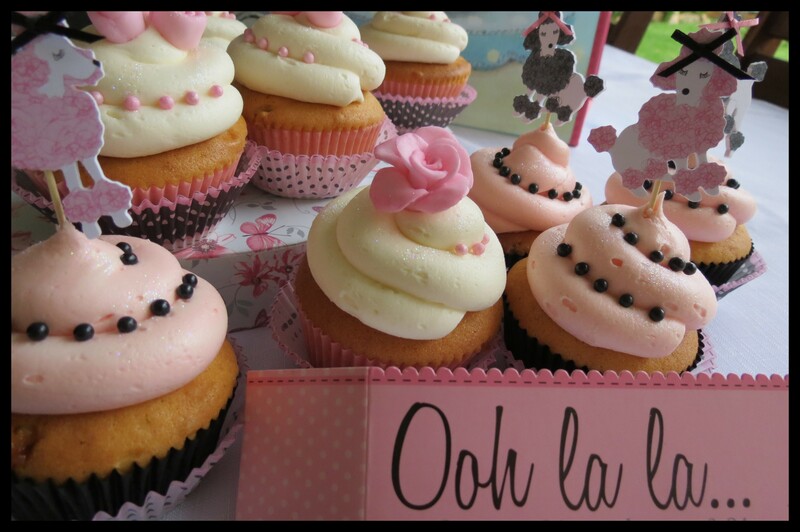 The pink pearls sit pertly on these puffy iced cupcakes along with the pink roses. For the other half of the cupcakes I coloured the icing with a dash of pink colouring and added black pearl beads in the iced grooves. I used the poodle cupcake toppers for these cupcakes and then placed all the cupcakes into the fancy French cupcake liners. A tip here – rather bake your cupcakes in a plain coloured cupcake liner and then pop them once they are cooled into a beautiful printed liner as the cupcake liner will become slightly opaque on baking and the effect of the printed liner will be lost if you bake the cupcake directly in it. The contrasting liner will only add zhoosh to the colour palette of your decor. Thanks Jeanine for another interesting and really fun order and I hope you and your guests had an Ooh La La birthday celebration! Lisa they are gorgeous – and I saw them ‘in the flesh’ or should I say the cake 🙂 love your cakes and your writing!!! !